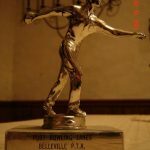 The Belleville School PTA had a student bowling league in the 70’s at the Port Bowling Lanes after school. At the end of the league season there were awards presented at an annual awards night. I believe the trophy’s consisted of Gold, Silver and Bronze. The awards were presented in the upstairs rec room. The bowling lanes were downstairs. The original building burned to the ground in the early 80’s. It was across from the Belleville Cemetery. This entry was posted on Sunday, April 13th, 2008 and is filed under Amusement Parks, Bowling Lanes, Featured, Recreation. You can follow any responses to this entry through the RSS 2.0 feed. You can leave a response, or trackback from your own site. The Newburyport Recreation was built in the mid 1950’s and had historical signifigance as the first bowling alley building designed to fit automatic pinsetters with room to work on them and not just shoehorned in. The top level was a roller skating rink while the bowling alley was in the basement. The Gagnon’s sold the business to Tony & Rose Del Genio (my parents) during the summer of 1979. The complex’s name was shortened to Port Rec Center and the bowling alley was Clipper City Bowl and the skating rink was Clipper City Skating. We operated the bowling alley and skating rink until renting out the skating rink area to Port Gymnastics around 1982. Around 1 AM on the morning of Tuesday, November r 19 ?, 1984 a power surge caused an electrical fire that quickly spread throughout the wood framed building. Fortunately the Port Women’s bowling league had just finished a few hours earlier and the building was empty. The Newburyport Fire Department and other responders did a great job of containing the fire until a water main was lost around 3AM and during the time a line was run to another main the fire was able to spread throughout the building. The building also housed Hersey’s Pharmacy, Dede’s Bus Stop and Diner, Bob’s Barber Shop and the Meat Market. One memory engrained into my mind of that event was around 7AM when the fire was essentially out, one of the fire fighters came out of the freezer of the Meat Market with a side of beef on his pike and deciding it wasn’t quite done yet and putting it back in. John (post #1), I remember you well, even the red sox game you took some of us regular players to one Patriots Day. I bowled on the same team, KingPins, at the rec. for 18 years.. Before it was a bowling alley .. it was Lefty Mitchells Garage…Lefty converted it too Port Rec… and ran it for a number of years.. then Leo Gagnon took it over.. Was a sad day when it burned.. I think we all spent a good deal of time at the Port Rec growing up, both upstairs and down stairs, what a great memory. And I remember Leo too not just from ” The Rec”, but from when I worked at Towle Silver as well. I also remember going to the bowling alley in the square near Bossy’s , wow that was a long time ago. Who could forget Lefty at the Port Rec! He was quite a character. I still have some of those trophies from the old Rec student bowling league. The original owners – Lefty and Ruth Mitchell were family – I grew up at the Rec (Lefty passed away around 1980 – Ruth in 2007 or 2008.